Every month, members of the Canadian Beauty Bloggers vote for a brand and theme of the month. 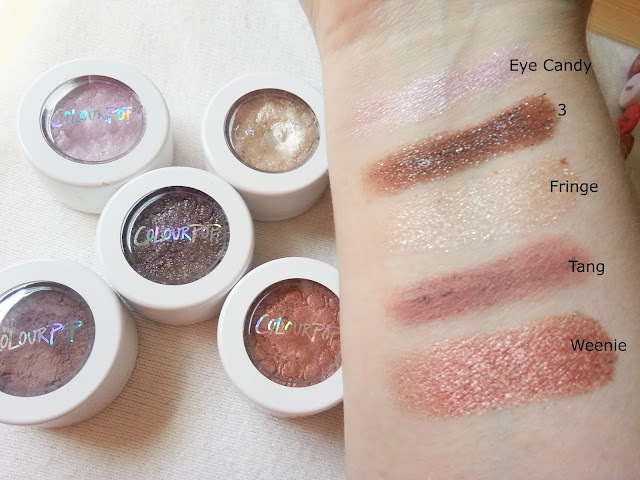 This month, Colourpop was the brand that was chosen. I decided I would split my collection of Colourpop into 3 posts, with a focus on Part 1 being the Super Shock Shadows, Part 2 will be Lippie Stix and Part 3 will be liquid lipsticks. 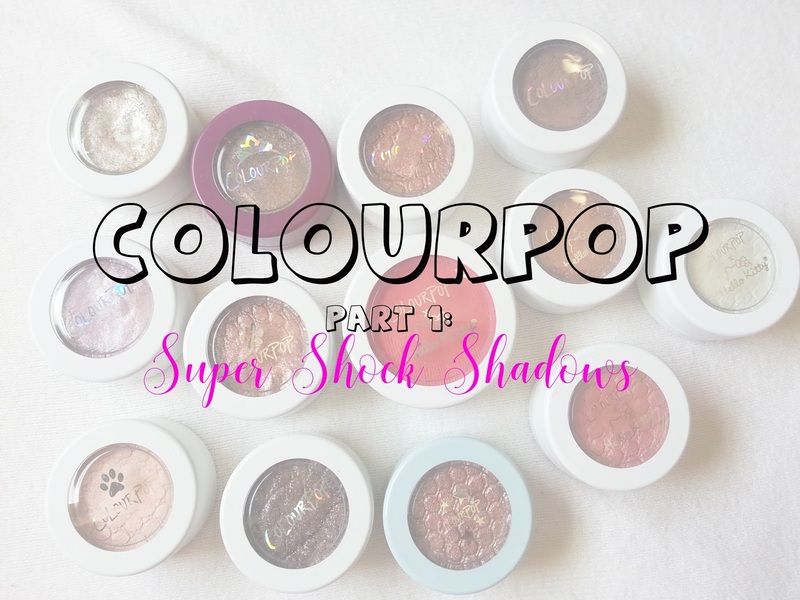 So without going on too much, let's take a look at what Super Shock Shadows I have in my collection! 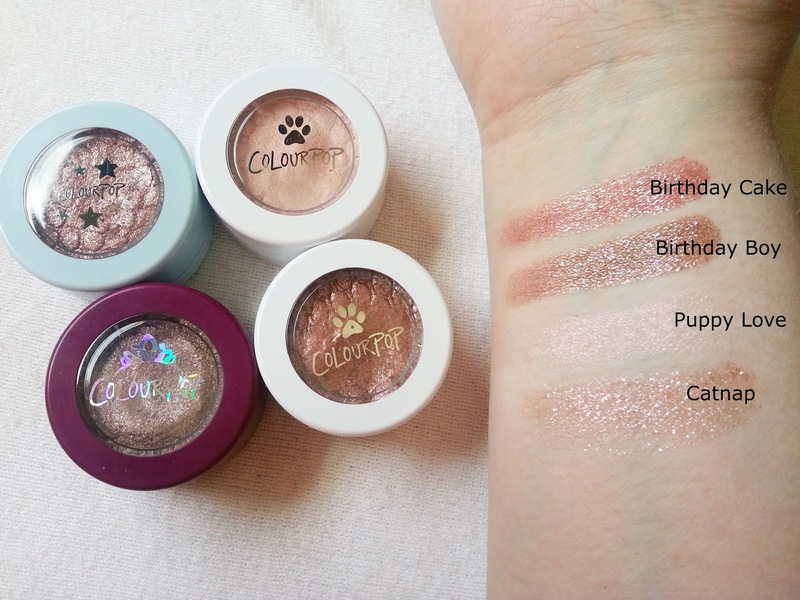 If you've never heard of Colourpop - where have you been?! Just kidding! Colourpop was launched in 2014, and all of their marketing was done online through social media. They have no actual physical store, and everything is purchased online through their website. They've collabed with YouTubers such as Kathleen Lights, and their line of products have grown throughout the years. 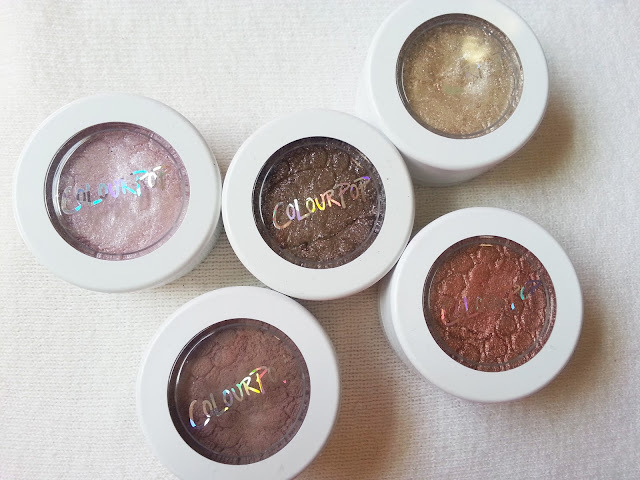 Their Super Shock Shadows come in a variety of finishes and colours.. such as mattes, metallics, bolds, and neutrals. They sell for $5 USD, and are 0.07oz in size. 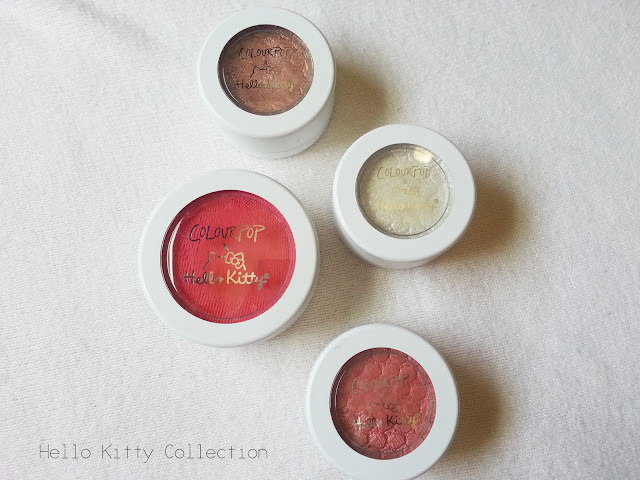 They are sold as individual shades, but are sometimes bundled as a collection. This was a limited edition collaboration with Hello Kitty. The eyeshadow kit had four shadows, but I ended up selling one off (School Bus) because it was a colour I wouldn't wear. You can see my original haul on this collection here. 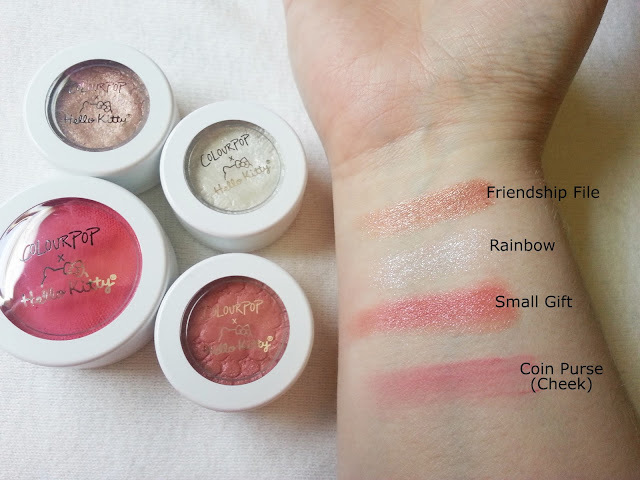 I added the blush to these swatches and in this category because I don't have any other face products that are from Colourpop. All of these shadows were only available for a limited time. The two coloured shadows were in celebration of their birthday. A purple pot for 2016, and a blue pot for 2017. The two with paw prints were created in support of the Best Friends Animal Society. All proceeds of the purchase of those two eyeshadows would be donated to Best Friends Animal Society(R) and their NKLA effort to Save Them All. And these are just random super shock shadows that weren't marketed as being limited edition or part of a collaboration. In my collection, there are some shades I reach for more over others. I will say I am disappointed in Tang because of the texture. I'm not sure if I got a bad one, but it's very crumbly (as you can see in the swatch) and kind of wet. I love the colour of it, but I wonder if that is a common complaint in the matte formulas. I'm wearing Weenie (ultra metallic rose gold) all over the lid, Tang (soft plum beige in a matte finish) in the crease, and 3 (cool toned bronze with multi-coloured glitter) on the outer edge. I find the shades I have of the super shock shadows make it hard to create a full look because all of them are glitters/shimmers with the exception of Tang. Using your fingers is really the only way to get good pay off with them as well. Also on my face: Smashbox Photo Finish Primer Water, L'Oreal Infalliable Pro Glow in 201 (Classic Ivory), MAC Studio Fix Powder plus Foundation in NW15, NYX Dark Circle Concealer in Fair, Nars Radiant Creamy Concealer in Chantilly, Essence Make Me Brow in Brunette, Eyeko Black Magic Mascara, Milani Blush in Berry Amore, Colourpop Ultra Matte Lip in Clueless. Finally... 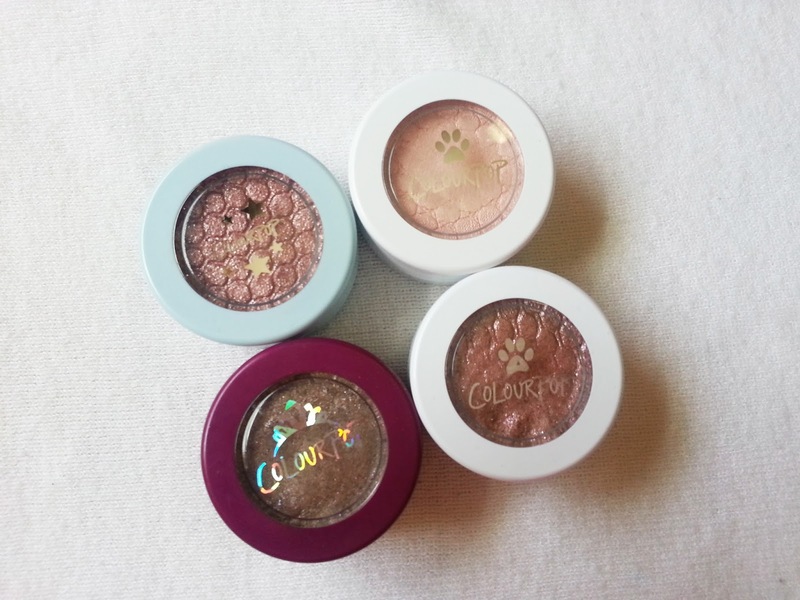 I just received some of the new Colourpop pressed powder shadows. I only ordered 4 so I didn't want to create a whole new "part 4" for four shadows, so I've included them here. 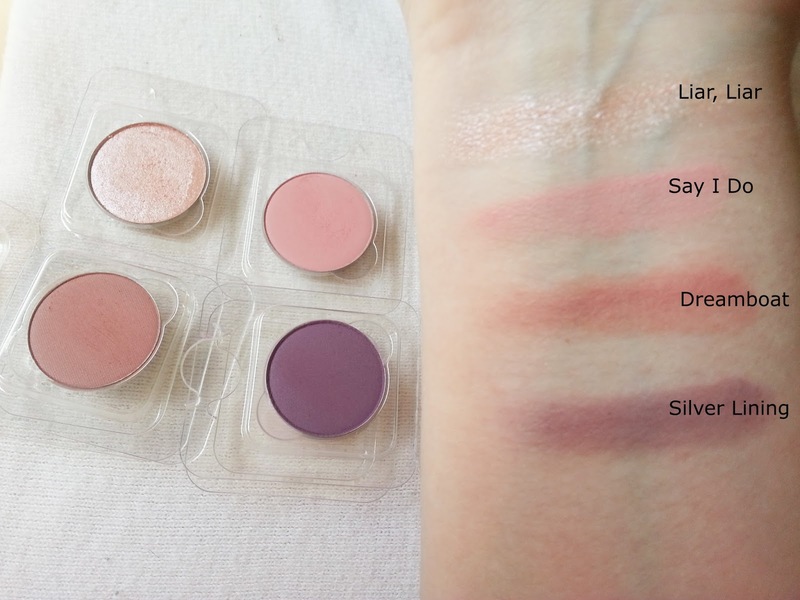 The pressed powder shadows are sold as singles, and they also sell for $5 USD. They are 0.04oz in size. They are smaller than the super shock shadows, but they can be placed in any magnetized palette, which is really convenient since the super shock shadows cannot be taken out of their pots. 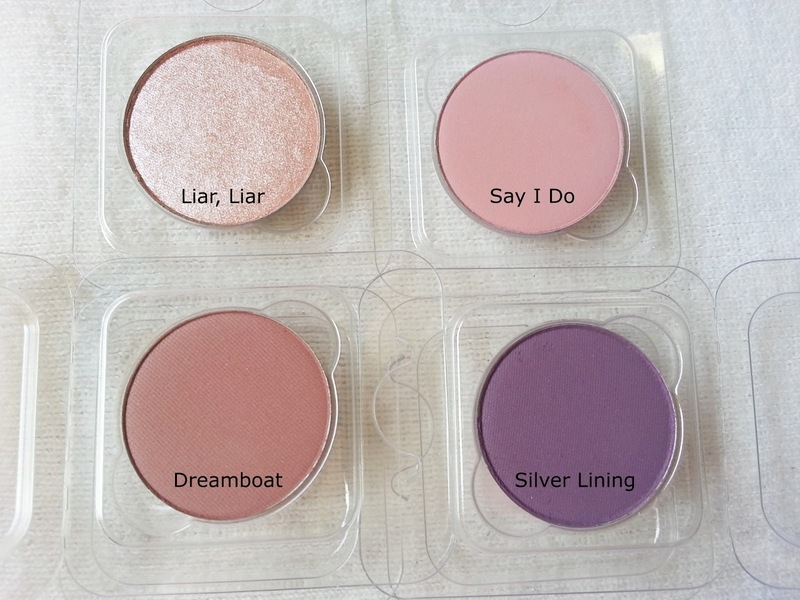 The pressed powder shadows were released earlier in 2017. This eye look was created using the pressed shadows. I started with Dreamboat in my crease, and then added Say I Do over top. That obviously was a more pigmented shade because dreamboat is pretty much invisible now! I used Silver Lining and Say I Do on the bottom lash line. I applied Liar, Liar all over the lid with a touch of Birthday Boy (super shock shadow) in the middle to give the look more sparkle. Liar, Liar is also applied in my inner corner. Also on my face: Smashbox Photo Finish Primer Water, Nars Sheer Glow Foundation in Mont Blanc, MAC Studio Fix Powder plus Foundation in NW15, NYX Dark Circle Concealer in Fair, Nars Radiant Creamy Concealer in Chantilly, Colourpop Super Shock Blush in Coin Purse (Hello Kitty Collab), Kat Von D Tattoo Liner in Trooper, Colourpop Brow Pencil in Bangin' Brunette, Essence Make Me Brow in Brunette, Eyeko Black Magic Mascara, Colourpop Ultra Matte Lip in Solow. I'd like to eventually add more single shadows to my collection! But I'm in no rush. Going through my Colourpop collection made me realize I don't reach as much for them as I should!